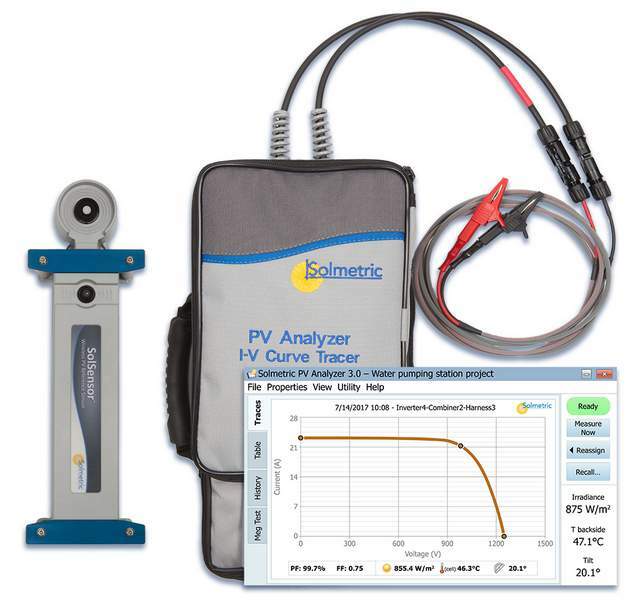 The PVA-1500 PV Analyzer Kit is a 1500 volt I-V curve tracer with built-in PV performance modeling and advanced wireless irradiance, temperature and tilt sensing from Solmetric. It provides unprecedented measurement throughput and accuracy and delivers deep insight into the performance of your arrays. 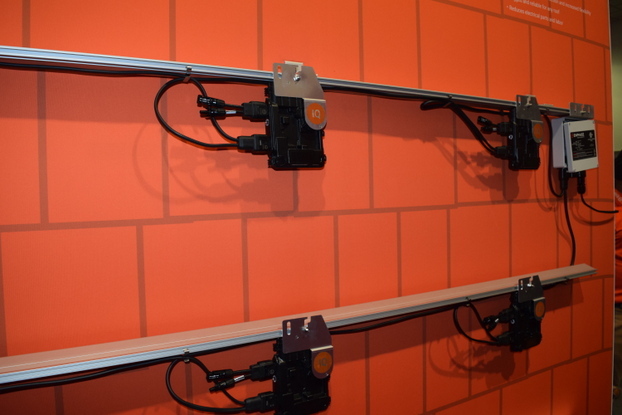 You can see it for yourself at Solar Power International, booth 352. In addition to the 1500V measurement capability, the PVA-1500 has a few additional enhancements over its predecessor, the PVA-1000S, including using WiFi to communicate to your tablet or laptop. This eliminates the USB dongle required for the PVA-1000S. The PV Analyzer is designed to work as hard as you do. High measurement throughput means it can measure 1 MW in less than 2 hours–even in hot environments where other curve tracers shut down. In an example PV system with 1300V Voc, 16 strings per combiner box, and 5 minutes to move to next combiner box, the PVA can make more than 800 measurements at 25°C ambient and 250 measurements at 45°C ambient. The incident angle corrected SolSensor is able to make accurate irradiance readings in lower light conditions extending your working window. Global renewable energy developer, service provider and wholesaler, BayWa r.e. is partnering with three national advocacy and charitable organizations on a cool booth game at this year’s Solar Power International (booth 1838). The Giving Game, as it’s being called will involve booth visitors spinning a prize wheel and voting for one of the chosen organizations: Women of Renewable Industries and Sustainable Energy (WRISE), Vote Solar and Grid Alternatives. At the end of the show, an award ceremony will announce the organization that has received the most votes and a $5,000 top prize. The runners up will also receive a donation based on the number of votes. The more people that play, the more money BayWa donates. This program is a continued part of BayWa r.e. Giving, which focuses on providing increasing knowledge of and access to sustainable energy with STEM focused education opportunities, project donations and community engagement. BayWa r.e. has delivered 50 kW of free renewable energy projects and over $100k in funding since it was founded. BayWa r.e. Giving pays particular attention to generating positive impact on the communities surrounding the company’s work. At the All Tribes Charter School in San Diego CA, BayWa r.e. delivered a 25kW rooftop solar system to provide free energy for the school, along with STEM materials to support education on the science and engineering behind the project. The school was set up by two pioneering educators to address the cultural and socio-economic challenges faced by Native American students. BayWa r.e. Solar Systems LLC has also contributed to natural disaster relief. After Hurricane Maria hit Puerto Rico last year, the company contributed equipment and transportation to assist in the recovery efforts. 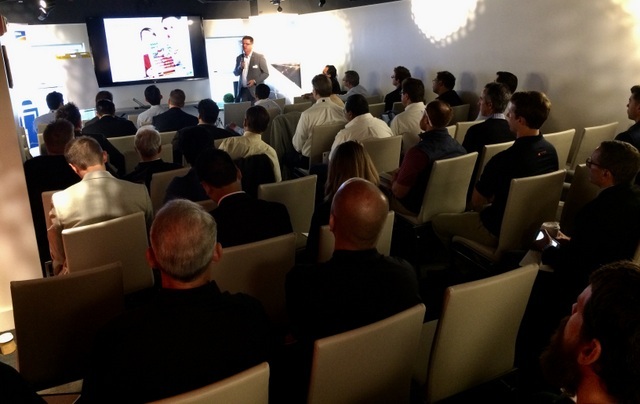 Following large-scale storage forums in San Francisco and Kassel, Germany, as well as several smaller storage events worldwide, SMA will host another forum in Las Vegas during Solar Power International. 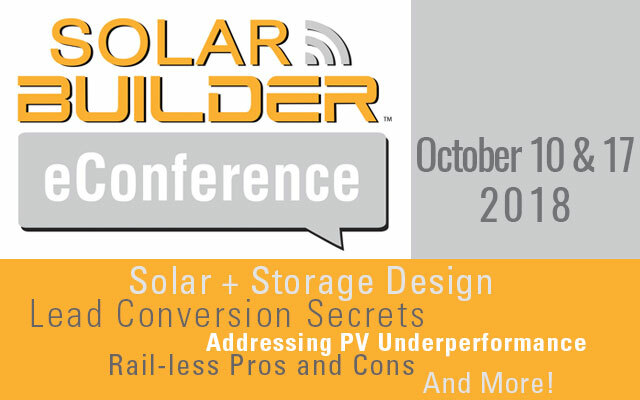 The Utility-Scale Storage & PV Forum is geared toward solar professionals focused on utility-scale storage and solar, and will highlight cutting-edge solutions for utility-scale projects. The event will take place Tuesday, September 12, 2017, at the Excalibur Hotel & Casino. Topics to be covered during the program include challenges and solutions for high-penetration PV networks, the value and uses cases for storage and how to achieve maximum ROI. It will also will highlight SMA’s full power class lineup of UL listed storage solutions for 1,000 and 1,500 V applications. The forum will begin at 8:30 a.m. and run until 1:30 p.m. In addition to educational sessions, the event will provide valuable industry networking. Seats are limited, and early registration is encouraged. Get a group of solar industry leaders on a stage in 2016, and all discussions tend to veer into the existential. This is our takeaway from this year’s Solar Power International conference, which took place in Las Vegas, Sept. 12-15. Obviously everyone on those stages agreed that solar power should be the way of the present and is the way of the future, but the path to that future is the main subject of debate. How do we get there? Is it net-metering? What role do utilities play there? What is the collaborative solution? The bad news is no one has the final answer on those questions, but the fact that these are questions in the first place is good news because it means the solar industry has a crucial role to play in the world going forward. We just have to pick a path. Here are some routes to get there, according to voices on stage during the general sessions over the course of three days. 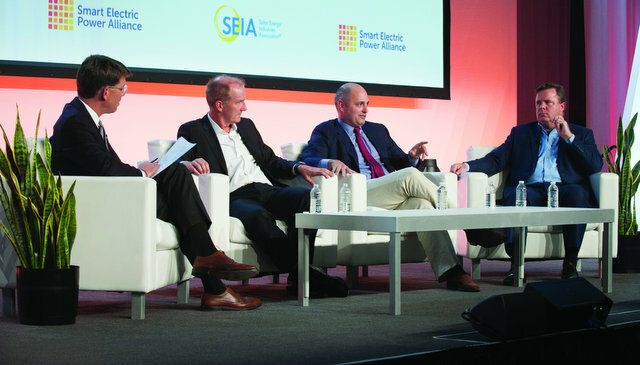 From left: Jeffrey Ball, Stanford University; David Crane, Pegasus Capital Advisors; Nat Kreamer, Spruce Financial; Steve Malnight, Pacific Gas and Electric Co.
California is the world’s sixth largest economy, and the success of its solar industry should be instructive to the rest of the country and world. But as Nat Kreamer, president and CEO of Spruce Finance, pointed out, you can’t draw a straight line from California policy to every other state in the union. In places like Nevada, there is a misalignment of interests in the utility business model and public policy that instead leads to lines drawn in the sand. 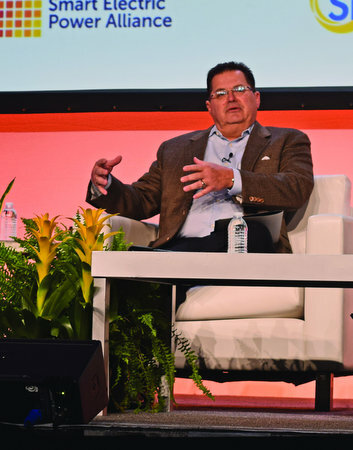 Without the benefit of hindsight though, distributed generation got its start in many places the way it had to, considering it wasn’t price competitive, noted David Crane, senior operation executive at Pegasus Capital Advisors. In retrospect, too many companies went public too early and hurt the industry’s ability to be nimble. From left: Julia Hamm, SEPA; Kenneth Munson, Sunverge Energy; Ron Nichols, Southern California Edison. The other battle that panelists continued to bring up was for the more nebulous concept of the hearts and minds of consumers. Is there a tipping point for solar panels to be the “next iPhone” or a part of a similar shift in the way people live? As the industry has shown getting to this point though, changing prices are somewhat integral to changing behavior. To Lynn Jurich, CEO at Sunrun, the goal right now is almost to stay that same course, just work to reduce the complexity of everything — so, changing behavior through simplicity. This gives you an idea of what’s happening under the panels. At Solar Power International we got an upclose look at the complete Home Energy Solution with IQ that Enphase Energy, Inc. is excited to push to the market in 2017. The plan for the Home Energy Solution is ambitious, as Enphase is trying to move past selling pieces and parts of a home PV system and evolve into a completely integrated solar, storage and energy management offering. This version of the AC module is slick. It won’t be ready to go until you slide it up and click it into place (as shown here). The solution starts with company’s sixth-generation Enphase IQ Microinverter System, which supports high-powered 60- and 72-cell solar modules. They are 30 percent lighter than Enphase S-Series microinvertes and can be integrated in upcoming AC modules from LG and SolarWorld to offer even faster and simpler installations that save on soft costs. 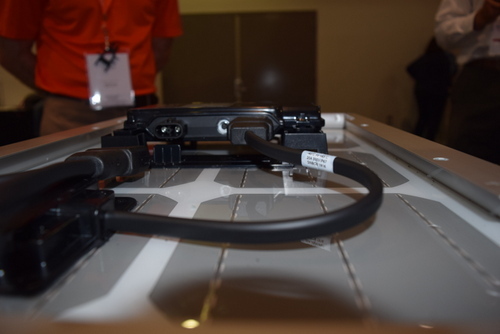 The two-wire Enphase Q Cable is 50 percent lighter than the previous generation of Enphase trunk cable; the Enphase Q Aggregator offers simple “plug and play” connection for up to three branches on the roof; and the Enphase Q Combiner provides further installation and commissioning efficiency. The Enphase Home Energy Solution with IQ uses a single technology platform for seamless management of the whole solution, enabling rapid commissioning via the Enphase Installer Toolkit; consumption monitoring with a metered Envoy and CTs; and energy insights from the Enlighten Software platform’s easy-to-use interface. The Enphase IQ 6 microinverters comply with fixed power factor, voltage and frequency ride-through requirements, and meets current and known future requirements for distributed solar on utility networks, including Rule 21 in California and Hawaiian Electric Company Rule 14H. The Enphase IQ 6 Microinverter System is expected to be available in North America in the first quarter of 2017.